That disaster, which claimed the lives of 11 rig workers, has made headlines round the world. By contrast, little information has emerged about the damage inflicted on the Niger delta. Yet the destruction there provides us with a far more accurate picture of the price we have to pay for drilling oil today. On 1 May this year a ruptured ExxonMobil pipeline in the state of Akwa Ibom spilled more than a million gallons into the delta over seven days before the leak was stopped. Local people demonstrated against the company but say they were attacked by security guards. Community leaders are now demanding $1bn in compensation for the illness and loss of livelihood they suffered. Few expect they will succeed. In the meantime, thick balls of tar are being washed up along the coast. Within days of the Ibeno spill, thousands of barrels of oil were spilled when the nearby Shell Trans Niger pipeline was attacked by rebels. A few days after that, a large oil slick was found floating on Lake Adibawa in Bayelsa state and another in Ogoniland. “We are faced with incessant oil spills from rusty pipes, some of which are 40 years old,” said Bonny Otavie, a Bayelsa MP. With 606 oilfields, the Niger delta supplies 40% of all the crude the United States imports and is the world capital of oil pollution. Life expectancy in its rural communities, half of which have no access to clean water, has fallen to little more than 40 years over the past two generations. Locals blame the oil that pollutes their land and can scarcely believe the contrast with the steps taken by BP and the US government to try to stop the Gulf oil leak and to protect the Louisiana shoreline from pollution. “We see frantic efforts being made to stop the spill in the US,” said Nnimo Bassey, Nigerian head of Friends of the Earth International. “But in Nigeria, oil companies largely ignore their spills, cover them up and destroy people’s livelihood and environments. The Gulf spill can be seen as a metaphor for what is happening daily in the oilfields of Nigeria and other parts of Africa. “This has gone on for 50 years in Nigeria. People depend completely on the environment for their drinking water and farming and fishing. They are amazed that the president of the US can be making speeches daily, because in Nigeria people there would not hear a whimper,” he said. It is impossible to know how much oil is spilled in the Niger delta each year because the companies and the government keep that secret. However, two major independent investigations over the past four years suggest that as much is spilled at sea, in the swamps and on land every year as has been lost in the Gulf of Mexico so far. One report, compiled by WWF UK, the World Conservation Union and representatives from the Nigerian federal government and the Nigerian Conservation Foundation, calculated in 2006 that up to 1.5m tons of oil – 50 times the pollution unleashed in the Exxon Valdez tanker disaster in Alaska – has been spilled in the delta over the past half century. Last year Amnesty calculated that the equivalent of at least 9m barrels of oil was spilled and accused the oil companies of a human rights outrage. According to Nigerian federal government figures, there were more than 7,000 spills between 1970 and 2000, and there are 2,000 official major spillages sites, many going back decades, with thousands of smaller ones still waiting to be cleared up. More than 1,000 spill cases have been filed against Shell alone. Last month Shell admitted to spilling 14,000 tonnes of oil in 2009. The majority, said the company, was lost through two incidents – one in which the company claims that thieves damaged a wellhead at its Odidi field and another where militants bombed the Trans Escravos pipeline. Shell, which works in partnership with the Nigerian government in the delta, says that 98% of all its oil spills are caused by vandalism, theft or sabotage by militants and only a minimal amount by deteriorating infrastructure. “We had 132 spills last year, as against 175 on average. Safety valves were vandalised; one pipe had 300 illegal taps. We found five explosive devices on one. Sometimes communities do not give us access to clean up the pollution because they can make more money from compensation,” said a spokesman. These claims are hotly disputed by communities and environmental watchdog groups. They mostly blame the companies’ vast network of rusting pipes and storage tanks, corroding pipelines, semi-derelict pumping stations and old wellheads, as well as tankers and vessels cleaning out tanks. The scale of the pollution is mind-boggling. The government’s national oil spill detection and response agency (Nosdra) says that between 1976 and 1996 alone, more than 2.4m barrels contaminated the environment. “Oil spills and the dumping of oil into waterways has been extensive, often poisoning drinking water and destroying vegetation. These incidents have become common due to the lack of laws and enforcement measures within the existing political regime,” said a spokesman for Nosdra. There is an overwhelming sense that the big oil companies act as if they are beyond the law. 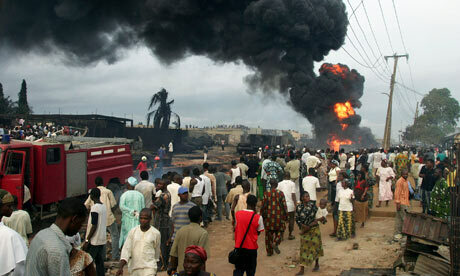 Bassey said: “What we conclude from the Gulf of Mexico pollution incident is that the oil companies are out of control. This entry was posted on Sunday, May 30th, 2010 at 7:18 pm.